THE ADDITION @Potong Pasir: FREEHOLD at Leasehold Price. 2 Mins Walk to MRT. The Addition at Potong Pasir is a freehold development located at 21 Meyappa Chettiar Road, District 13, North Eastern Region of Singapore. Situated at the land area of 898.1 sqm, this 8-storey freehold development comprises of 26 exclusive units, ranging from two, three, and three plus study bedrooms, and it is within 2 minutes walk away to nearest train stations – Potong Pasir ( North-East Line ) MRT Station. Future residents of The Addition Condominium will just need to take two minutes walk to Potong Pasir MRT Station and Poiz Shopping Mall, follow by approximately 8 minutes’ of train ride to arrive at the Dhoby Ghaut MRT Interchange which they can easily transit to the Circle Line and also the North South Line. Residents can also travel around 12 minutes to reach the Chinatown MRT Interchange where the Downtown Line will be there. The Outram MRT Interchange, which is 1 station away from the Chinatown MRT station, allows future residents to be able to access to the East West Line. Oxley Holdings Limited is a home-grown Singaporean property developer. Oxley is principally engaged in the business of property development and property investment. Since its inception, the Group’s accelerated growth has resulted in a burgeoning presence both locally and overseas. It now has a presence across twelve geographical markets. This development will also offer Smart Home features. See the video on what is possible. Location. The Addition location offers you a home on the city-fringe in Potong Pasir, around 10 minutes drive from the CBD and Orchard Road. Potong Pasir is one of the most promising residential estates of Singapore. It is undergoing a regeneration, with the development of Bidadari across from it, and the sell-out launches of several new condominiums in the vicinity. Like the Nin Residences, Sennett Residences, Sant Ritz, The Venue, and Poiz Residences. Nearest MRT Station. The Addition condo location is less than 3 minutes or 150 metres walk from the nearest exit (C) of Potong Pasir MRT station on the North-East (Purple) Line. This takes you to Orchard Road within 10 minutes, Clark Quay, Chinatown, and Harbourfront. Shopping, Banks, Supermarkets, Food. One of the strong points of the Addition location is how convenient it is to shops, food and services. Across the road we have Poiz Centre with its 53,800 square feet of retail, shopping, services, and dining outlets.Behind Poiz, there is Potong Pasir Community Centre, that houses a Fairprice supermarket, fast food joint and bank, next to a food centre surrounded by coffee shops and local hawker stalls.Across the MRT underpass, we have The Venue Shoppes, one level of shops with 28 retail units. And the famous hawker fare at Tai Thong Crescent beside The Venue, that has been drawing foodies for decades.And for a change, you could take an evening stroll or a 2 minute train ride to the upcoming Woodleigh Mall, that will apparently be a good size, half that of the huge Nex Mall one train stop down at Serangoon MRT station. Schools. This place is great for families with young boys, with the Saint Andrew schools, from primary all the way to Junior College level within 5 minutes walk down Meyappa Chettiar Road. If you have girls as well, Cedar Primary and Secondary Schools are just outside the 1km range, and well within 2km. Both are high regarded schools, with a lasting tradition of holistic care. Accessibility. The Addition condo location sits close to access points to the PIE (Pan Island Expressway), KPE (Kallang Paya Lebar Expressway), and the CTE (Central Expressway), providing for easy access to the rest of the island. Bidadari has been called “The Next Bishan”, one of the much sought after and prime residential estates in Singapore. Bidadari is set to be transformed into a “distinctive and sustainable tranquil urban oasis”. 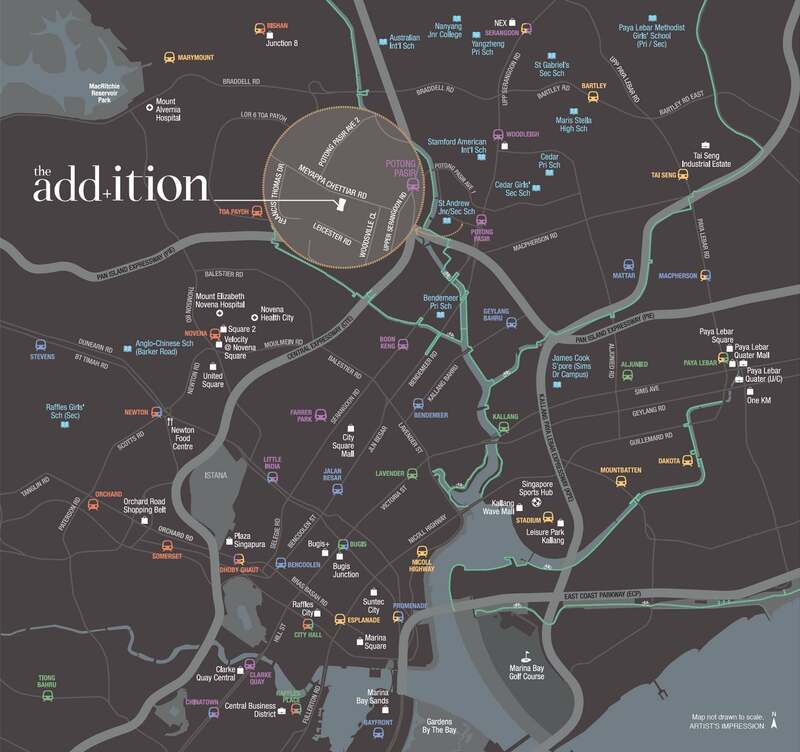 The Addition at Potong Pasir is located within minutes away from Bidadari New Estate. Such proximity brings with it assurance that your property will keep its value well.